Designing a professional development program for teachers requires many trade-offs. Longer programs can offer more value, but they can also cause training fatigue. 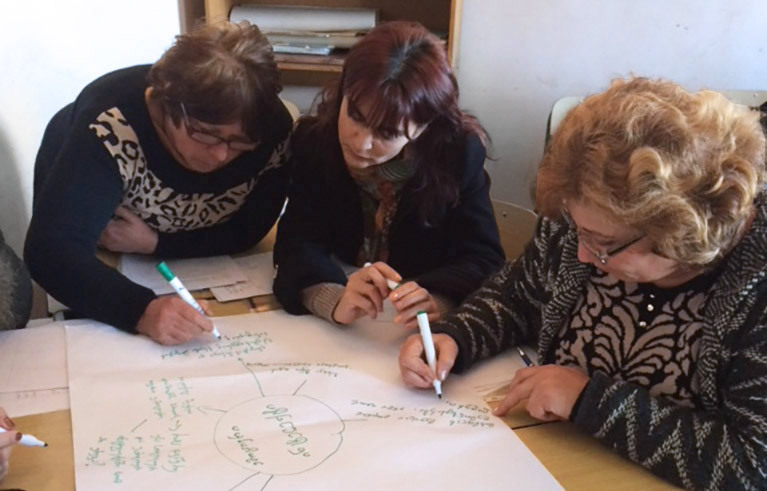 IREX and our partners have found that establishing professional learning communities can be an effective way to support teachers as they implement new teaching methods in their classrooms. A professional learning community (PLC) is a group of teachers with a shared commitment to reflect on their teaching practice and to learn both individually and collectively about the teaching practices that are the most effective for improving student learning. At this year’s Comparative and International Education Society Conference (CIES), I’ll discuss what IREX has learned from working with the Republic of Georgia’s National Center for Teacher Professional Development (TPDC) to support a system-wide professional development program for more than 14,000 secondary STEM teachers. In case you can’t join me at the panel (“Beyond Workshops: Effective and Sustainable Strategies for Teacher Professional Development”), here’s an overview of how professional learning communities can promote continuous learning and what questions we’d recommend asking when planning professional learning communities. There are many open questions about what type of professional development can improve teaching. Research suggests that effective teacher professional development includes active learning over a sustained period of time, with a focus on a specific subject. School-level research also shows positive effects when teachers share knowledge and reflect in professional learning communities. Over the past year and a half, teachers in Georgia have held more than 5,000 PLC meetings to reflect on successes and challenges in using methods that are often new to their teaching practice, including classroom assessment, differentiated instruction, and project-based learning. Since launching PLCs in the fall of 2016, we’ve learned a lot about what motivates teachers in Georgia to join these groups and stay committed to them. Based on this experience, we recommend considering each of the following questions when designing a similar intervention. In what ways are teachers already meeting and collaborating? Understanding how and where teachers are already sharing information is key to identifying the learning topics that are the most relevant for teachers and the times and spaces that are convenient for them to meet. In Georgia, IREX and TPDC staff met informally with teachers over lunch and coffee to find out how they already collaborate with and learn from each other. Teachers told our team that they highly value learning from others who teach the same subject. This encouraged us to design subject-oriented PLCs. What balance will we strike between central planning and local organization? Planning at the district level can build momentum when forming PLCs. This planning can include defining membership in the groups, identifying lead facilitators, and suggesting a set of initial meeting topics. Yet central planning has negative consequences, too. It can unintentionally deemphasize the importance of teacher-driven learning and create an expectation that an external body will maintain the PLC. In Georgia, teachers can earn professional development credits for participating in PLCs. This creates a need for some central planning and tracking. As the PLCs enter their second year, the level of external support is decreasing and teachers are doing more independent planning and goal setting for their PLCs. How will our design choices affect the groups’ convenience and accessibility for teachers? The frequency of planned meetings, as well as their location and duration, has a huge impact on teacher enthusiasm for PLCs. In the first year of the TEE project in Georgia, we aimed to organize PLCs that brought together teachers from different schools who teach the same subject. Although these PLCs remain active, we heard from teachers that arranging transportation and identifying central meeting locations was inconvenient and had a negative impact on their motivation to continue meeting. As we expanded PLCs in the second year, our team organized groups at the school level instead, giving up some of the connections between teachers of the same subject in order to increase convenience and accessibility. What topics and formats are the most useful for teachers? Although PLCs share some common characteristics, the content and format of meetings vary widely based on the learning goals of the community. In Georgia, facilitators prepared teachers to lead reflections on using new teaching methods. In other contexts, PLCs take on different topics and formats. Examples include PLCs in South Africa that focused on inclusive education and learning from data and a PLC in the US that focused on literacy and included coteaching by PLC members. How will we encourage principals and other school leaders to support and encourage teacher collaboration? Teachers are often highly motivated to collaborate with peers for learning and improvement. Yet principals play an important role in establishing collaboration and learning as a norm of the school culture. When principals understand the goals of PLCs, they are often more willing to find time for teachers to meet and to celebrate teacher learning and growth in a way that is positive and motivating for teachers. In Georgia, TPDC provides concurrent training on school management and leadership to principals that emphasizes the importance of teacher collaboration and learning and introduces principals to PLCs. We look forward to engaging with the education and youth community and learning from education experts from around the world about what works to improve the quality and relevance of education for young people.